Vandalism in response to violation of Authenticity of Site? 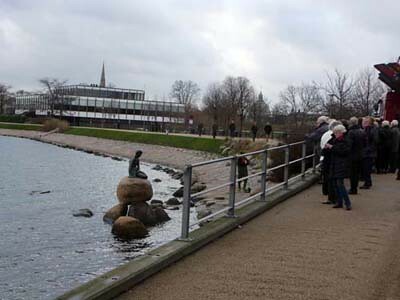 In connection with the international climate meeting in Copenhagen, December 7-18, 2009, the Danish artist Jens Galschiot (AIDOH – Art In Defence Of Humanism http://www.aidoh.dk) received permission to temporarily install a sculpture in the water about 5 m from the famous Little Mermaid. 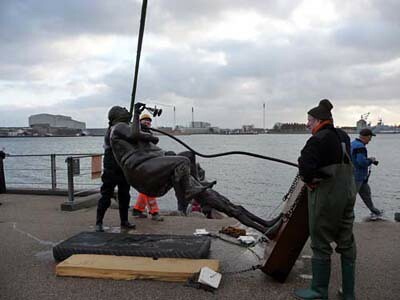 It is roughly the same size and is also cast in bronze. 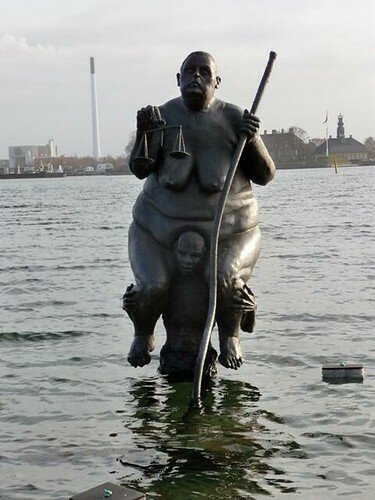 It depicts a very fat white woman sitting on the shoulders of a very thin African man, and obviously refers to the rich countries of the world “feeding” off the poor countries. 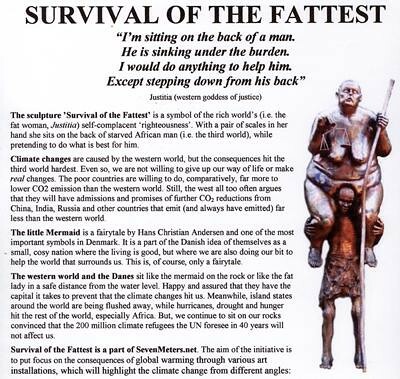 The title of the piece is The Survival of the Fattest . 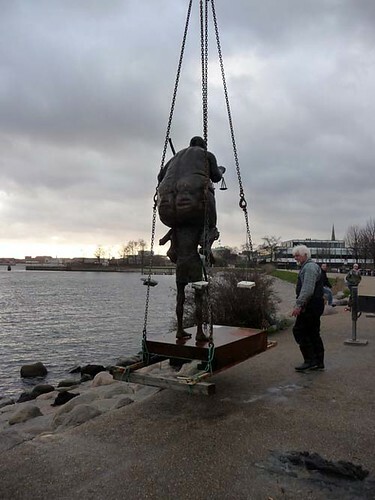 The first time I saw it about two weeks ago, I was a bit upset that someone had violated the "sacred" space of the primary tourist attraction in Denmark, an object that heavily contributes to the Danes' national and cultural identity. How dare someone infringe on the authenticity of this site! 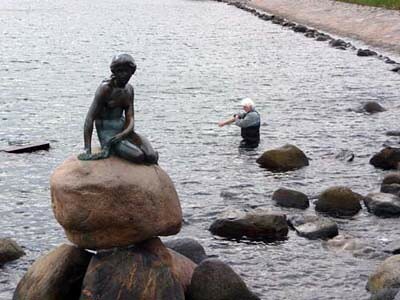 The Little Mermaid is a slightly smaller than life-size statue depicting a character from a story by Hans Christian Anderson, a young mermaid who fell in love with a prince and often came to the edge of the water in hope of seeing her love. 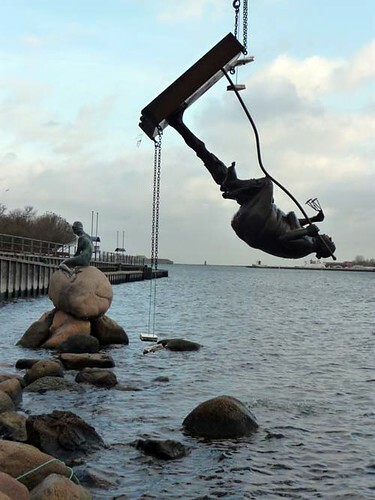 Paid for by Carl Jacobsen (Carlsberg Brewery) and created by Edvard Erichsen, the delicate figure has been sitting on a mound of boulders at the waterfront in Copenhagen since 1913. 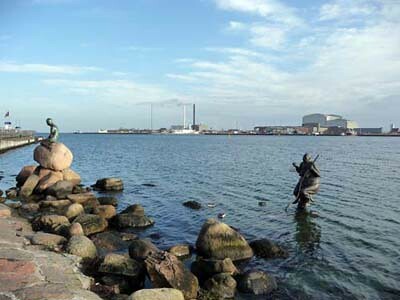 75% of the visitors to Copenhagen see this statue. But then I read the information sign, I could see the point of exhibiting these two statues together and I thought it was an effective way to make a statement. 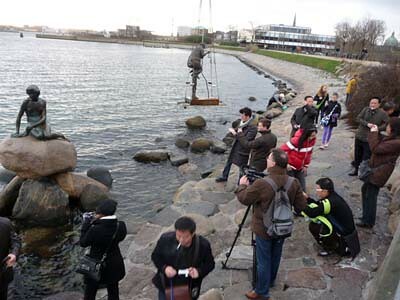 It might even catch the eye of some of the visiting officials – if they have time to visit anything in Copenhagen, it will surely be the Little Mermaid. The juxtaposition of the two statues is very provocative. Three days ago I had a visitor from Poland, whom I dragged down to the waterfront in stormy weather to see the double attraction. The Survival of the Fattest was gone! 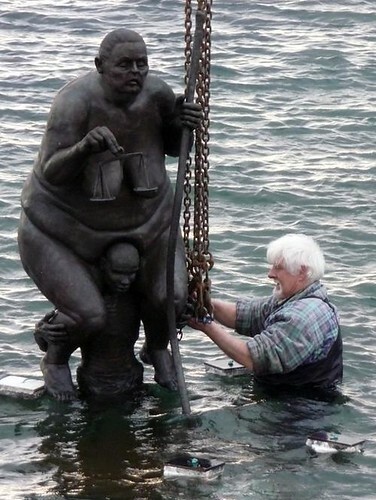 How could someone have stolen it – it must have weight a half a ton? Well, it was not gone. Someone had toppled it over so that it was no longer visible above the water. 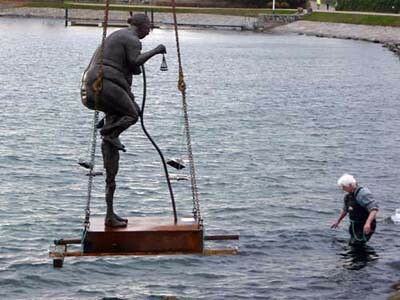 This was technically feasible if they had been in a boat and lassoed the statue. 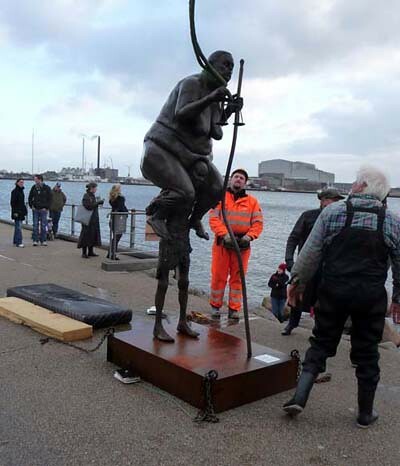 Apparently, someone was so upset by this work of art that they resorted to vandalism. One can speculate about the reasons for this action, but I do not think it far-fetched to think that someone responded in a way similar to my own initial reaction. 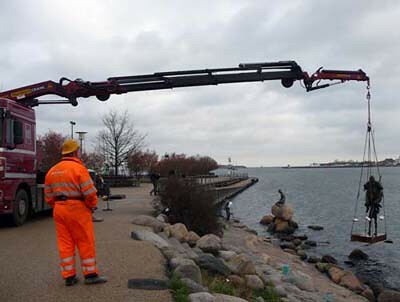 By chance I happened to walk past this spot this morning, and I saw a crowd of people and a big crane. 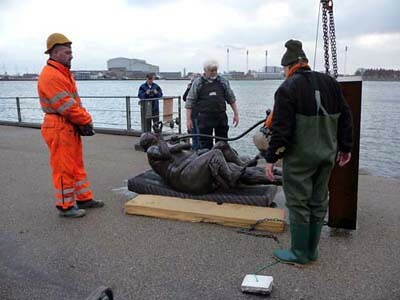 The artist and his longtime assistant and welder, Kurt Lilliendal Hansen had come to rescue the statue. 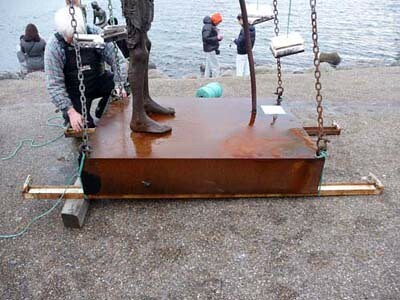 I watched as Lilliendal Hansen waded into the water (air temp 6 C, cold northwesterly wind) and attached some chains to the base. 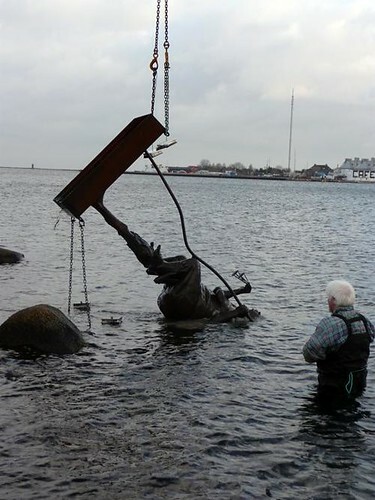 The crane pulled the sculpture out of the water, and placed it on some foam. 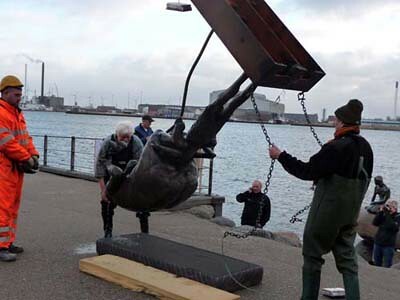 It was then lifted up into an upright position, some stabilizing beams were fixed to the base, making it more difficult to topple, and then the statue was deposited back in or close to its original position in the water. 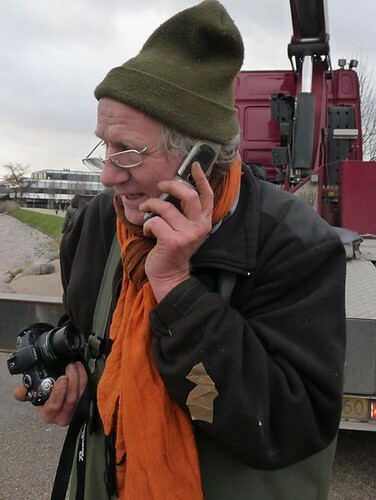 The rescue operation (see documentation below), took about 1 hour and was carried out at the artist’s expense. He was constantly interupted during the process by telephone calls - friends, acquaintances, journalists wanted to know what was going on. I couldn't help overhearing the excitement with which he related the events. I guess he reacted to the vandalism as a provocative rebutal to his own provocation. Re: Vandalism in response to violation of Authenticity of Site? Some years back in a curatorial effort at one of the museums in India, the curator asked various artists to interpret some of the works in the collection. 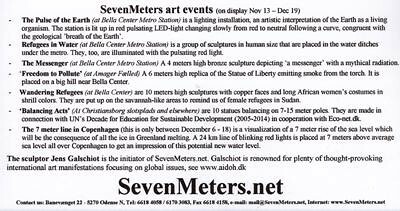 As anticipated this raised a lot of debate and controversy....the exhibition was I believe a success. 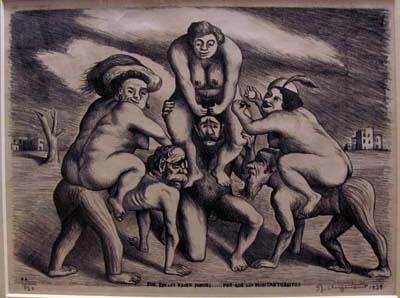 One of the interpretation by an artist was to hang an important work by a dead artist upside down with some additions. Every individual has a right to creative freedom..
but is this right absolute to the extent that it is overbearing on the right of another artist who may not be able to defend his work. How ever strong the message and how so ever potent the image and great the artist may be ....???? if he/she wants to communicate a message/ shock etc it should not be at the cost of another person. but does the artist have a right to intrude into a landscape that has its own vocabulary and meaning. the story is equally tragic ...unsustainability...is the underlying theme in both works. yet both have their own meanings and messages. Is their a justification for intrusion of space no matter how strong/valid politically correct the message maybe...the subject also make the opposition no matter how justified seem invalid with little or no bearing on individual rights. In the article, the authors describe how a cultural group whose access and "ownership" of a sacred site was restricted by its new status as a heritage site in some ways accepted the vandalism of the site so that it would no longer be "national" heritage and might revert to being their own space. The article also describes the kinds of compromises and political reconciliation that was required to restore access to the site, ensure its continuing safety and of course a generally improve social relationships. 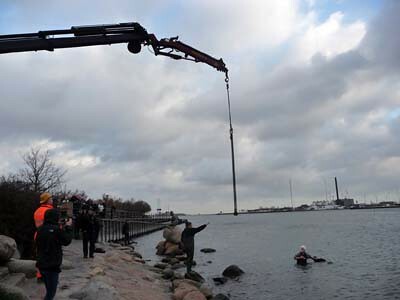 While this situation isn't exactly that of the Copehagen sculptures, it reminded me of how fiercely local communities claim their spaces--sacred or otherwise--and how cultural institutions, even with the best intentions, can inadvertently destabilize environments. In context of the fat lady and the conversation started by Isabelle, I came across this picture at the British Museum, with the attached caption. 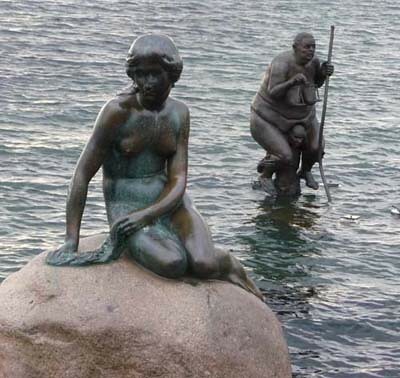 In some ways I feel that, where as obviously the imagery and the concept of the fat lady is not original, by being parasitic on the mermaid it helps to shock. In any other setting the message would have had probably the same importance as a news clipping of a natural disaster or some other violent act but by intruding the space/comfort zone of the viewer the artist derives some vicarious pleasure. Artists have done this for ages,this is not novel, however it is only now that vandalism is fast becoming a part of the artistic vocabulary. 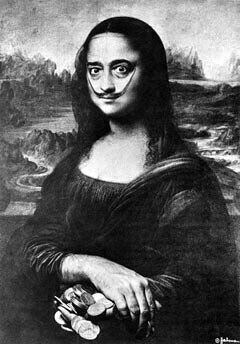 Dali's Mona Lisa for example has an identity of its own even though it depends on the Mona Lisa, I can't imagine Dali painting a mustache on the original, even if he had the opportunity. Is this cannibilasation acceptable ? 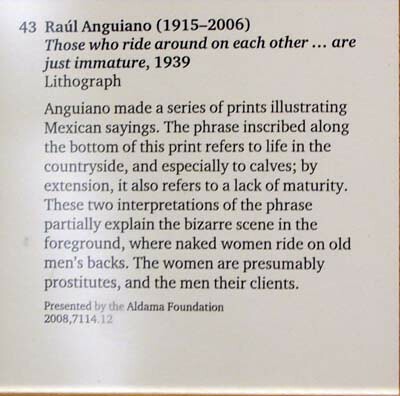 Raul Anguiano and many others have effectively used the medium of art to communicate simple and complex ideas without vandalism. 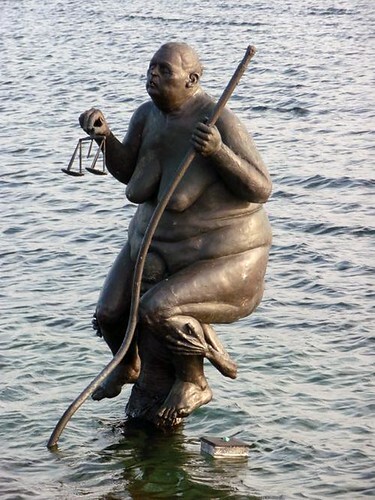 It might be pertinent to ask the question, would the people who are represented by the artist, and I would include the fat lady too...since the artist does not exclude himself, assent to the vandalism? How so ever just or valid a cause or potent the message...destruction, vandalism is akin to terrorism.